American Express, a financial services company, found that smokers were costing the company $5,000–$6,000 more per year than nonsmokers. With medical costs rising 10 percent–15 percent per year, the board of directors wants to discuss whether the company should refuse to hire smokers. Nationwide, about 6,000 companies refuse to hire smokers. Costs are driving the trend not to hire smokers. According to the CDC, a smoker will have 50 percent higher absenteeism and, when present, will work 39 fewer minutes per day because of smoke breaks, which leads to 1,817 lost hours of annual productivity. A smoker will have higher accident rates, cause $1,000 a year in property damage (from cigarette burns and smoke damage), and will cost up to $5,000 more a year for annual insurance premiums. Few people would fault a company for trying to control costs and maintain a productive workforce, but the question is how far should a company go in pursuit of these goals? Law professor Don Garner believes that “If someone has the ability to do the job, he should get it. What you do in your home is your own business.” Others say such policies set a dangerous precedent. “These things are extremely intrusive,” said George Koodray, assistant U.S. director of the Citizens Freedom Alliance. If companies begin by discriminating against smokers, they might next discriminate against people who are overweight in order to cut costs. As a manager, you have a hard decision regarding such a policy because your choice has implications beyond hiring decisions. On what basis should the company decide whether or not to hire smokers: the best interest of the firm, what the law allows, or individual rights? As a manager you have to consider both ethics and social responsibility. Ethical decision making is concerned with doing right and avoiding wrong. Social responsibility is a broader goal to pursue policies that benefit society. Should you protect an individual’s right to smoke if it places a burden on society? Is it ethical to promote society’s rights if it infringes on the rights of the individual? The board is charged with increasing shareholder wealth, so they particularly want a decision that’s in the best interest of the company’s financial health. Do you promote shareholders interests over those of the individual or society? If you were in charge at American Express, what would you do? This scenario enables us to explore fundamental questions about the nature of ethical and legal behavior in business. It also highlights the tension between our ideals and how they play out in the real world. Sometimes, acting in ways that are ethical and legal are one and the same thing. Other times, they are not. Legal behavior follows the dictates of laws, which are written down and interpreted by the courts. In decision making, determining the legality of a course of action is facilitated by the existence of statutes, regulations, and codes. Unlike ethical considerations, there are established penalties for behaving in a way that conflicts with the law. However, as society evolves, what constitutes legal behavior also changes. For example, until recently, the possession or use of marijuana was illegal in the State of Colorado. As a result of the legislation that legalized marijuana, existing laws will need to be reinterpreted, and undoubtedly additional laws will be enacted to govern what was formerly illegal behavior. Whether or not an individual thinks it is ethical to use a potentially harmful substance, the fact is that the law now allows such behavior. Using these as working definitions, let’s return to American Express. If the company decides not to hire smokers, then the company would essentially be interfering with the individual’s right to engage in a legal activity. If the company dictates to employees about smoking, what else can they decide for employees? The National Institute for Health reports that the aggregate national cost of overweight and obesity combined was $113.9 billion. Does the company set Body Mass Index (BMI) limits for potential employees to reduce the cost of medical coverage for obesity-related illness? As you can see, such decisions are complex—and, some would say, a slippery slope. Would American Express’s decision not to hire smokers constitute lifestyle discrimination? A company can require that employees not smoke during their shift or anywhere on company premises, but does it have the right to require them not to smoke when not at work or not on company property? According to the ACLU, it can become lifestyle discrimination if the company requires that employees not smoke when they’re not at work, off duty, and/or off work premises. 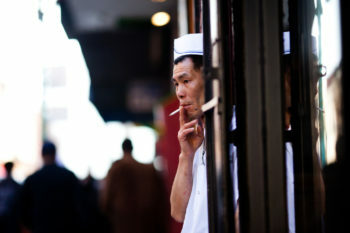 In fact, smokers are protected from employment-based discrimination in at least two dozen states.. More than half of the states in the U.S. protect employees against employers who impose certain lifestyle requirements, such as only hiring non-smokers or refusing to hire individuals who are obese or have high cholesterol. Clearly American Express is dealing with a legal issue when considering the non-smoker policy, but as with the ethical issue, it’s not cut and dried. As this example shows, people take positions and make choices within different frameworks, and those frameworks, while overlapping, are not always perfectly aligned. The legal framework establishes laws that govern behavior while the ethical framework contains sets of standards and rules governing the behavior of individuals within groups or professions. As you will see in the rest of this module, when businesses try to “do the right” thing—by the law, by their shareholders, by their employees, by their customers, and other stakeholders—there is often a complex interplay of ethical and legal considerations.